Saturdays in the fall belong to college football. And when 3:30 p.m. rolls around, televisions get switched to CBS, and its the Verne Lundquist show. For the final time on Saturday, the SEC on CBS will feature Verne’s smooth calls, historic stories, and the relationship with color commentator Gary Danielson that millions have been accustomed to for more than a decade. It’s only fitting that the SEC Championship features Alabama and Florida, as the two teams will play in this game for the ninth time, easily the most of any match up in SEC Championship history. For those who have never met Mr. Lundquist, he brightens up a room with his chuckle, his phrase “Oh my goodness” will be cemented into college football fans’ memory as they will attempt to soak up his last two games. The 76-year-old could not speak higher of his fans, and experiences over the last couple weeks working. Lundquist will wrap up his illustrious college football broadcasting career the next week, as he will be on the call for the historic 117th Army/Navy Game. For now, all we can do is reflect; reflect on the calls we will never forget. The “Kick-Six”, the “Prayer at Jordan-Hare”, Tim Tebow’s jump pass. Next year, Brad Nessler will take over for the legend, as Nessler has been broadcasting for either CBS or ESPN since 1990. For what Verne Lundquist will do next year? Maybe working on his comedic side. Verne’s broadcast partner Gary Danielson got emotional when talking about the end nearing, describing it as more of an “earthquake of emotion” than anything, with now just one more SEC broadcast left after 11 years working together. 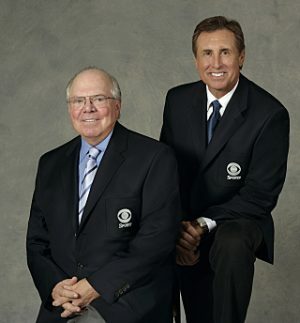 Verne Lundquist College Football play-by-play announcer and Gary Danielson College Football Analyst. The sports world already said goodbye to one iconic broadcaster in October, when baseball broadcaster Vin Scully broadcasted his final game. This one is a little different, as Lundquist will continue to broadcast the Masters and college basketball. Who can forget his masterful call of Tiger’s chip on the 16th at Augusta in 2005, or the Laettner buzzer-beater in 1992? Lundquist has broadcasted more than 20 different sports for CBS and been a part of the broadcasting community for 53 years. He recently was honored with the Sports Emmy Award for Lifetime Achievement.